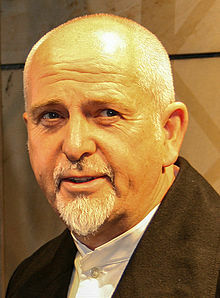 Peter Brian Gabriel (born 13 February 1950) is an English singer and songwriter. He became famous as the singer and flute player in the progressive rock group Genesis. After leaving Genesis, Gabriel went on to a successful solo career. More recently he has spent his time on producing and promoting world music and pioneering digital distribution methods for music. He has also been involved in various humanitarian efforts. Gabriel was awarded the Polar Music Prize in 2009. This page was last changed on 24 December 2017, at 20:51.